This stole was designed for mohair lace yarn, but could be made using any kind of wool or wool/silk lace yarn. Yarn with synthetic fibers in it is not recommende, as that would make it difficult to block well, and the pattern only really shines when it’s fully blocked. Skill level: Advanced. The charts have pattern rows on both RS and WS. Using mohair yarn makes it a little easier to work this shawl, as that makes it practically unnecessary to work directional decreases. 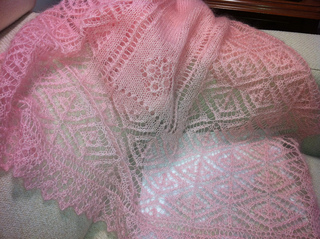 The stole as shown uses 420 m or all of two skeins. If you want a longer or wider stole, buy 3 (or more) skeins and work more repeats as indicated in the pattern. The Snow Queen is designed to be seamless to avoid any unnecessary breaking of yarn and give you minimal finishing to do.